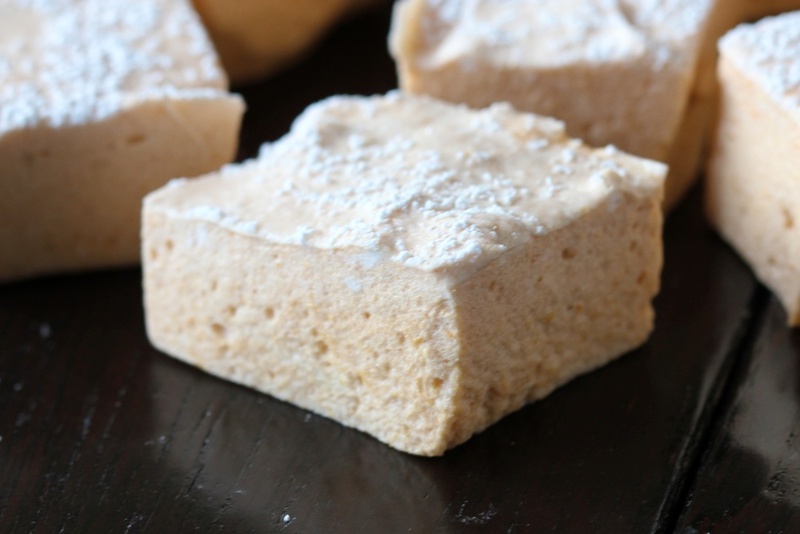 Corn syrup is an essential component in making marshmallows but it's one that has sparked much debate. This has forced manufacturers like Karo to reformulate their product making it high fructose free, so check your labels. Corn syrup functions to prevent the sugar from crystallizing when cooked, so I wouldn't omit it. A little tip for successful marshmallow making is preparation. Have all your ingredients and equipment in place, and your pan oiled and ready. There's no time to waste when adding the sugar syrup to the gelatin or the whipped marshmallow to the pan. It sets up quickly. Coat an 8 x 8 baking pan with cooking spray. Use a paper towel to blot the excess. Keep it light. In a small heatproof bowl, whisk the gelatin and cold water together. Set aside to soften for at least 5 minutes. In a medium saucepan, add the sugar, 1/4 cup of the corn syrup, water and salt. Bring to a boil, attach a candy thermometer and simmer briskly until the temp reaches 250F. Keep an eye on it so it doesn't burn. Meanwhile pour the remaining 1/4 cup of corn syrup into the bowl of your mixer fitted with the whisk attachment. Microwave the softened gelatin on high for 20-30 seconds until completely melted. Pour it into the corn syrup. Set the mixer on low (stir) and keep it running. In a small bowl, whisk together the pumpkin puree with the spice and vanilla. Once the syrup reaches 250F, pour it slowly into the mixer bowl with the mixer still running. Increase the speed to medium (6) and beat for 5 minutes. Increase to medium-high (8) and beat 5 more minutes. Add the pumpkin puree mixture. Beat on the highest speed for one more minute. Give mixture a quick stir with the spatula and then immediately pour into the prepared pan. Work quickly as it will set. Smooth the top using a offset spatula, smoothing it into the corners. Using a strainer, sprinkle the coating mixture over the top. Set aside uncovered on a counter for at least 6 hours. Do not refrigerate. To unmold, use a knife to loosen the edges. Invert onto a work surface sprinkled with confectioners sugar. Cut into squares using kitchen scissors.